Not gonna lie: I'm so looking forward to school starting. My children return tomorrow. (Which is why I hear angels singing.) This has been a wacky summer for me. Not sure why. And my kids have been extra wacky. Not sure why. I have been more lax than ever this season. But I'm over it. I need order restored & structure reinstated! The Mr. & Zoey's favorite memory was also the island I shared with them. Pazely's fave? Her birthday. Of course. I've got a bit of a lump in my throat as Zoey will be entering middle school. I'm trying to keep a cool, chill, calm attitude in front of her though. Pazely has the same teacher Zoey had last year, so I almost feel like I already know the ropes there. I'm looking forward to a tea & breakfast tomorrow morning with my sister & mom. Our once-a-month teas won't be the same without grandmother, but we felt like it was important to continue. And tomorrow you all can look forward to what has turned into a tradition of my "1st day of school photo sessions" with the girls. Oh, the drama of it all! Your picture is hilarious! And so true . . . 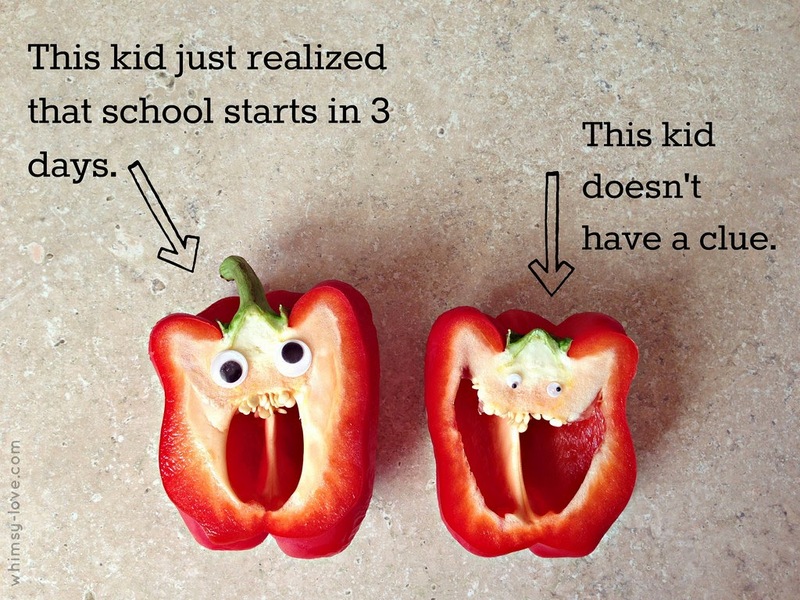 I am also eagerly waiting for school to begin. Ours doesn't start until after Labor Day. I know what you mean with the 'lump in the throat' with your oldest entering middle school. I felt the same way when mine did . . . and now this year he starts high school. He can hardly wait and the lump in my throat this year has more to do with, "holy cow, how can I be old enough to have a high schooler?!!"